Meeting in London October 1919, representatives from sailing nations in Europe except Germany agreed upon the 2nd International rating rule, the R-rule of 1919. The formula agreed upon was made valid for six (6) years from Januray 1st 1920 to Decemmber 31st 1925, and was subject to revision based upon experience every 2nd year. Europe’s sailing nations are recovering from the war. The main upcoming event is the Olympic regatta in Antwerpen 1920. However with less than one year to go few nations are in position to have new designs constructed under the new R-rule in time for the Olympic event. The old R-classes of 1907 are still very much alive in Europe and it is decided to call for entries in both old classes and new classes, in total 14 classes in the 1920 Olympic sailing regatta. In 1921 Lloyds presents scantlings for the new R-classes to be agreed upon by the members of I.Y.R.U. Evaluation based upon experience with the new R-rule takes place including discussions on factors in the formula. In Scandinavia the development of new R-yachts is until the mid 1920-ties very much rested with the designers Johan Anker and Bjarne Aas in Norway. Returning from London to Norway, Johan Anker makes plans for converting his own Eight Metre sH22 “Brand V” to new international. Converting consists of putting on cabin roof, adjusting sail area and measuring her to the R-formula of 1919. In accordance with decisions within I.Y.R.U. “Brand V” is under the new international R (1919) rule given sail racing no 8 N1 i.e. class identification no 8, national identification for Norway N, and national sail racing identification number 1. Johan Anker tailor designs two yachts to the new R-rule which both are constructed in 1920, one Six Metre "Jo" and one Eight Metre to be known as 8N2 “Sildra”. Based upon 8N1 “Brand V” as prototype, several other S-Eights are to the coming Olympic trials in spring 1920 converted to new international with new sail racing numbers, with or without cabin roofs. sH25 “Apache” who had won the Kattegat Cup in 1918 and 1919 (owner Magnus Konow) is converted with sail racing no 8N3. J.A.Jespersen converts his sH33 “Rocambole”, new sail racing no 8N4. However, he acquires Ankers new design 8N2 “Sildra”, which becomes Olympic Gold Medal in the 8mR(1919) new Class. 8N4 is sold to Sverre Gulbrandsen, Oslo named “Revanche” ex “Rocambole” ex “Sans Souci”. sH26 "Hei paa dig" is converted to 8N5 "Rural" owner Jac. Store Lorentzen, Kristiania. All Johan Ankers S-Eights are given converted 8N racing sail no. except sH24 "Pingvin" which in 1919 is sold by J.Hals to Haakon Bang and named "Tornado" before she again is renamed "Pingvin IV". J.Hals acquires in 1921/1922 8mR(old) "Shanty", ex "Petrel" constructed in Rostock 1910 and names her "Pingvin V". Magnus Konow, owner of converted 8N3 "Apache", decides to crew onboard 8N2 "Sildra" and becomes Gold medal in the Olympics. The other contender and Silver medal for Norway in the 8mR(new) Class becomes Jens Salvesen with sH27"La France" converted to 8N6 "Lyn". sH35 "Knabb" is converted to 8N10. Her owner Nils M. Thomas (previous owner of H5 "Quinta") crews onboard 8N6 "Lyn" becoming Silver Medal in the Olympics with Jens Salvesen. Reclassification from S(1917) to R(1919) is influenced by the various elements in the rating formula with agreed restrictions. No restriction on height of masts was included in the R(1907) nor the S (1917) rules. Compared to R (1907) yachts, sail area on the S (1917) yachts was cut back, and although masts were higher with their Bermuda sail plan, height, weight and strength of masts, were thought to be matters for consideration by the designers. In the new R(1919) rule, restriction on height of masts was initial agreed to two times waterline length, i.e. max 2 x L.W.L. above floating waterline. As waterline length increased on new designs this restriction had to be revised and since 1928 has been 2 x R + 1 meter, which for an Eight Metre is 17 metre above deck level. Comparing the initial S-yacht Certificate for sH34 “Betty III” dated May 16th 1919 with the converted R-yacht Certificate for 8 N9 “Inger” ex “Betty III” dated June 15th 1920 gives an idea on how the differences in restrictions on the rating elements would influence yacht performance. For details go to 8mS Register - sH34 Data sheet. Converting her from S(1917) to R(1919) the main sail area on “Betty III” is reduced from 71.42 m2 to 68.013 m2 and jib area from 28.37 m2 to 27.01 m2, i.e. element “S” in formula is altered from (71.42 + 28.37) = 99.79 m2 to (68.13 + 0.85x27.01) = 90.97 m2. Height of mast is reduced to 2 x L.W.L above waterline. For most S-yachts the initial L.W.L. was around 8.25 m and freeboard 0.75m which gives a limited mast height of 16.5m above water or approximately 15.75 m above deck level. The 8mS yacht (yard no 223) Anker modifies for Mr. Eilert Sundt in spring 1920 is given sail racing no 8N11 and name “Verano II” (i.e. “Snarken”). “Verano II” is certified R(1919) with element “S” in formula = 90.32 m2 and mast leach on main = 14.70m. Rating R(1919)=7,96. For comparison sail area “S” in formula on converted 8N1 “Brand V” = 86.87m”, rating R(1919)=7,94. On 8mR(new) 8N2 “Sildra” sail area “S” in formula is 80.53 m2 and rating R(1919)=8.00. On converted 8N9 "Inger" ex "Betty III" of the same drawing as "Verano II" ("Snarken") sail area in formula "S" = 90.97m2. Rating R(1919)=7.988. Another converted yacht is 9mR(1907) “Pandora” which is outfitted with new Bermuda sail plan and certified to the new R(1919) rule given sail racing no 8N12. 8mR(1907) “Sans Atout” which won Silver Medal in the Stockholm Olympics in 1912 is outfitted with new Bermuda sail plan (S=90,78m2) and converted new sail racing no 8N16. The freeboard "F" in formula is on converted 8N1 "Brand V" 0.73m, on new 8N2 "Sildra" 0.85m, on converted 8N6 "Lyn" 0.74, on converted 8N9 "Inger" ex "Betty III" 0.75, on 8N11 "Verano II" ("Snarken") 0.76m and on converted 8N16 "Sans Atout" 0.65m. Freeboard on converted 8N12 "Pandora" is from her listing as 9 s.m. in 1919, 0.69m. Note: A&J means Anker & Jensen, designer Johan Anker. Yard no. 220,221,223, 225 and 227 were all laid down based upon Johan Ankers drawing dated 27-9-1918. Note on 8N11: A&J yard no. 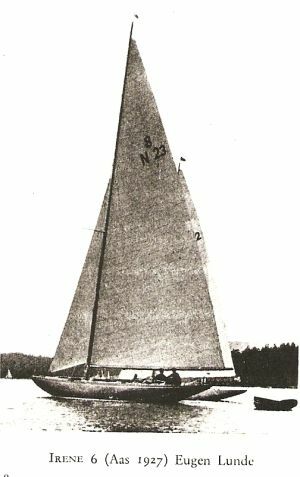 223 was laid down in 1919, owner Engineer Arne Blakstad and sail racing no. sH36. The contract with Blakstad was cancelled most probably due to the in summer of 1919 ongoing discussions on the revision of the R-rule. The constructed hull remains onshore and the now vacant sail racing no. sH36, is later in 1919 given to the last 8mS-yacht designed by Svenningsen. A&J yard no 223 is launched in 1920, modified with permanent cabin roof and her sail area commissioned to the R-rule of 1919. Her owner is Eilert Sundt who names her "Verano II", race sailing no. 8N11. In 1921 "Verano II" also obtaines her S(1917) Certificate. Ref. copy of certificates included under "Snarken history" part I and part II. Her first sail racing no. sH36 is occupied, and several years later she is given sail racing no sH38 as the last registered S-Eight. Her most known name is "Snarken". In IEMA World Cup regatta at Hankö 1983 she races with sail no. 8N38. No other country had in the Olympic season 1920 so many yachts commissioned to the new international R rule of 1919 as Norway, 12mR, 10mR, 8mR and 6mR. Of these only two were constructed, tailor designed to the new R-rule of 1919, 6mR “Jo” and 8mR “Sildra”. Both participated in the Olympic regatta in Antwerpen. In UK activity was picking up after the War although few new constructions took place in 1920. This caused by high cost, lack of materials, high salaries, and lack of crew. Only one 8mR “Antwerpia V” designed by Fife, and one 6mR “Tan-Fe-Pah” designed by Linton Hope were constructed, both for owners in Belgium to the Olympics. Although converted 8mS “Lyn” had beaten 8mR “Antwerpia V” in the Olympics, Johan Ankers new design 8mR “Sildra” had during 1920 proved so superior that the converted 8mS yachts in 1921 decided to go back and race in their own Class. Modified 8mS, 8N11 “Verano II”, was commissioned to the S-rule, S certificate dated May 14th 1921, owner Ole R. Thoresen, KNS. 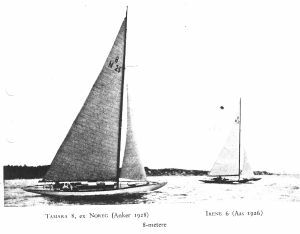 As to the converted R (1907) yachts, 8N16 “Sans Atout” raced in the old 8mR class and 8N12 “Pandora” mounted her old gaff rig and raced in the 9-10 s.l. class. 6mR “Jo” designed by Johan Anker and which won Gold in the Olympics, was sold to Britain. In 1921 several 6mR were constructed in UK, racing on the Clyde, testing out the new R formula. To the 1921 season Johan Ankers designs “Brand VI”, drawing date 13.09.1920, owner Johan Anker, sail no 8N18. Anker expressed that he was so satisfied with the performance of 8N2 “Sildra” that he could not do better for 1921 than designing “Brand VI” as a follow up on “Sildra”. “Sildra” had after the Olympics been sailed back to Oslo with a crew of only two men and partly in rough weather. Her hull was as large as an old 9 Metre and her Bermuda sail plan was easy to handle, and although sail area was cut back she performed extraordinary. In wind forces 5m/sec and above she was superior to any other Eight Metre and in wind of 8-10 m/sec the difference could be as much as 10 minutes on a 20 mile course. Also in wind less than 5 m/sec she would have just as many competitors behind as up front. In rough seas her front deck was still dry. Johan Anker had all reasons to be pleased with his first 8mR(new) design and constructed the follower “Brand VI” for his own use in 1921. “Brand VI” and Johan Anker was a winner and became the only contender in the 8mR(new) Class in KNS regattas 1921. In KNS spring regatta June 1921 she beat the winning 8mS yachts “Apache”, “Erle II” (ex “Lyn”), “Brand V” and “Top II” with approximately 2 min. After the 1921 season Anker sold “Brand VI” to Björn A. Malm, who named her “Top III”. The development taken place under the R-rule of 1907 with longer and narrow yachts with increased sail areas and less cruiser friendly was not wanted. The minimum displacement restriction, the in 1921 upcoming new scantlings and heavy taxation on sail area in the formula were means to avoid such development. As such “Brand VI” was a step in the wanted direction. “Brand VI” overall length was 14.58m compared to “Sildra” 14.73m, waterline length 8.70m versus 8.82m, beam 2.42m versus 2.34. Girth “G”, girth difference “d” and freeboard “F” about the same, and sail area “S” in formula slightly increased from “Sildra” 80.59sqm to “Brand VI” 81.44sqm. Scandinavia Sailing federation (SSF) in meeting Kristiania (Oslo) on Februar 20th 1921 decided that yachts belonging to the 8mR Class should be fitted out with minimum 3 berths, cupboards (0.3 m2) and wardrobe (0.3 m2). Instructions for fitting up the 8mS yachts were already included in the S-rule of 1917 (Appendix). Alfred Benzon, Denmark was appointed representative for Scandinavia to I.Y.R.U. Permanent Committee with Johan Anker as Deputy. When the new R-rule was laid down in October 1919, members of IYRU had agreed to evaluate the factors in the formula after two years, i.e. fall of 1921 with the possibility to agree on means to secure a sound development based upon experience gained with the formula so far. The formula agreed upon in 1919 was a further development of the S-rule of 1917 which was a modification of the R-rule of 1907. The main compromise was on the division factor in the formula, factor 2.5, which the Scandinavians felt was too high and would result in Eight Metre hulls large as old Nine Metres escalating construction cost. The rule was made valid for a period of six (6) years, from Jan. 1st 1920 to Dec. 31st 1925, with possible revision of factors every second year. To the London meeting in IYRU on December 7th 1921, Johan Anker suggested to change girth 1/4G in the formula to 1/8G, and girth difference 2d to d. A step in the same direction as Anker had suggested in 1919 eliminating “G” and “d” entirely from the formula, suggesting R= (L+sqrtS-F)/k. The British whom to start with in 1919 advocated for the Universal Rule as new International, were in end 1921 so found of the new rule that they opposed changes in the formula. However, one change imposed by the British in the measurement of element "L" was confirmed. The first international R-rule of 1907, the S-rule of 1917 and the new R-rule laid down in 1919 had all bow girth difference and stern girth difference included in the measurement of element "L" with factor 1 at the bow and factor 1/5 at the stern. This was changed by the Permanent Committee to factor 1,5 at the bow and factor 1/3 at the stern. The change should not apply to yachts laid down before Jan. 1st 1920. How this change came about is part of the Rules History to be told, and the following information is obtained with reference to Seilas yachting magazine no 2 of January and no 4 of February 1920. This took place at a time when most S(1917)-yachts and some R(1907)yachts were under convertion to new international R(1919) and Johan Anker had made his new design 8mR "Sildra", drawing dated 19.01.1920. The first matter for discussion was the continuation of SSF after revival of I.Y.R.U.? The main purpose of SSF when founded in 1915 was to coordinate yachting interests in Scandinavia during the War, and modification to the international R-rule of 1907 which elapsed Dec 31st 1917. Critics arose on the individual delegate behavior during the I.Y.R.U. Oct. 1919 conference in London. The purpose of SSF must be to coordinate matters before I.Y.R.U. although individual interests could be spoken if firstly dealt with by SSF. The decision was made to continue the federation and invite Finland to officially join SSF. This invitation was unanimously accepted by the Finnish Sailing Federation in meeting on March 13th 1920. The Finns had approved the S-rule of 1917 reasoning that this was in the best interest of Scandinavia as well as the S-rule was thought to be appropriate for re-measurement of their older yachts, American rule as well as International rule. In the London Oct. 1919 meeting Scandinavia had supported Finland in getting their popular 30 and 40 sqm classes accepted as international. Next matter for discussion was a proposal from Y.R.A. to make changes in the international rule (R-1919) agreed upon by I.Y.R.U. in London, Oct 1919. To which the meeting unanimously decided to reply by telegram to Y.R.A. that SSF demanded respect for the mutual agreed decisions made under the London October 1919 conference. As representative from Scandinavia to I.Y.R.U. Permanent Committee SSF elected Alfred Benzon, Denmark with Johan Anker, Norway and Ljungberg, Sweden as deputies. Johan Anker was given authority to represent SSF in the upcoming meeting in I.Y.R.U. Permanent Committee for discussing the R-formula. Meeting within I.Y.R.U. Permanent Committee took place in London on February 13th 1920. The outcome was presented by Johan Anker in his speech to KNS members in meeting February 20th 1920 as reported in Seilas yachting magazine. The British had put a lot of emphasis in getting support for their suggested changes to the Oct. 1919 agreed formula. The changes consisted of factors in measuring L in formula, suggested change of factor 1 on bow girth difference to 1.5 and factor 1/5 on stern girth difference to 1/3. Further a change in number of classes and a change in the French 8.5 metre Class. In accordance with the new R-rule, no changes should take place within the first 6 years unless in the coefficients, which could be subject for revision every 2nd year. Now the British, within less than four months after the conference, demanded changes affecting all the older yachts, R-1907 yachts and S-1917 yachts. The risk of jeopardizing the fresh re-established cooperation within the international sailing community (except Germany and their allies) before it really started was at hand, and called for compromises to be agreed. Compromise was made that all yachts laid down prior to January 1st 1920 should be measured as before with bow girth difference factor 1 and stern girth difference factor 1/5 while all new designs should be measured as asked for by the British and supported by the French with the bow girth difference factor 1,5 and stern girth difference factor 1/3. This would then be equal for all new designs, although matter of opinion differed on what was best. (Comment: Harmony between the designers was established. The thought was to restrict long bow and flat stern overhangs, but at the same time the change resulted in narrower bow and stern hull sections. However, as reflected in the R-1928 ammendment and R-1933 rule, experience caused min restriction and a further change in bow girth difference measurement to take place, reducing the negative effect as yacht bows again developed sharper and narrower). As to international classes the British suggested to have 13mR Class as well as 15mR Class, thus running the risk that the 12mR Class would vanish which was not in the interest of Scandinavia. The compromise agreed included a 14mR Class and the individual R-classes agreed became; 6, 8, 10, 12, 14, 17 and 20 metre. Change in the French 8.5 metre Class was agreed as suggested. The Scandinavian S-1917 rule included detail requirements for the interior outfitting of the yachts. The British wanted almost “empty” 10mR and 8mR yachts for racing, less practical for cruising. The compromise was to stick to what previous had been agreed under the 1st international R-rule. So far Johan Ankers report from the Permanent Committee meeting on Feb. 13th 1920. Anker then addressed a topic of great concern to most yachtsmen within KNS - what about the existing fleet of R-1907 and S-1917 yachts? During the War several British and German yachts had ended up in Norway. Anker presented his thought of combining these two classes with the new class. He believed that the old R and S yachts would take pleasure in competing with the new R Class. 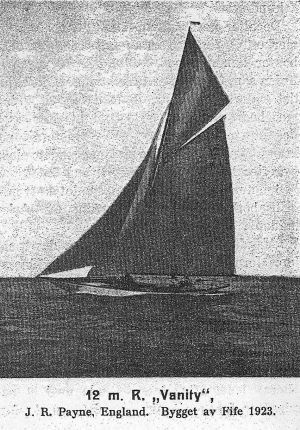 The R-1907 yachts had too much sail area and by reducing their sail area applying a Bermuda sail plan, and measuring them to the new R-rule should make the old Class yachts good racers as well as cruisers. The agreement made within I.Y.R.U. on bow girth measurement for yachts laid down before 1920 would in Ankers opinion prove favorable for the old Class yachts. Several other items were discussed as dealt with by the Permanent Committee, cabin roof, interior, sail area, height of masts. As to masts the London 1919 meeting had agreed that max height of mast above water should not exceed 2 times floating waterline length. A further restriction was in Dec. 1921 imposed on larger yachts above 12mR which height of mast should not exceed 1.75 times floating waterline length plus 5 feet. A proposal of prohibiting Bermuda rig on yachts above 10mR was rejected as this was a matter for the designers to consider based upon what was practical. Development of scantlings for mast was not yet up to agreement. With the December 1921 London I.Y.R.U. meeting, the first two year period of the 2nd international R-rule came to an end. Factors in formula remained as decided in October 1919 except for the modified bow and stern girth difference measurements in "L". Instruction for Measurers had been developed together with revised scantlings. Although scantling requirements were reduced (again strengthened in 1924) construction cost increased, and new yachts constructed in the larger classes were limited. The 6mR Class became most popular and recruited helmsmen from other classes as from the 8mR Class. KNS meeting October 31st 1922 discussed the matter of handicap racing for the larger yachts. During the last years interest for racing within the old classes 7mR and above had decreased. The reason was to high cost in keeping the yachts tuned up for becoming winners. Thus having a large fleet of yachts not racing running the risk of being sold out. A handicap system allowing boats to compete without the need for new sails every season could be the answer to this unwanted situation. The matter what to do with the old R-class and S-class had been up to discussion since the new R-rule came in effect in 1920. Ankers thought in early 1920 was that all yachts old and new could measure in under the new international R-Classes. Specially as more of the old yachts converted to Bermuda sail plan. 8mR (old) “Taifun” in 1922. Returning from Trondheim to Oslo she was outfitted with Bermuda sail plan. Olympic winner 1912, design Johan Anker. (Comment: This might have been the answer if the division factor in the new formula had been smaller as wanted by SSF. A factor 2.3 would have resulted in new hulls more of the same size as the old hulls with reduced sail area. Now a new 8 Metre had the size of an old 9 Metre with the sail area of an old 7 Metre.) Decision was made to combine the old R -1907 and S-1917 classes, and to commence with separate handicap classes. In 1926 the N.L. rule (S-rule of 1926) was agreed by SSF for handicap racing between yachts older than 2 years. Permanent Committee agreed in meeting on Feb. 13th 1920 to have I.Y.R.U. secretary Heckstall Smith in cooperation with Mr. Fife, to prepare Instructions for Measurers in accordance with DnV’s instructions for measurement of S-yachts. Many items were subject to agreement, no and length of battens, round or tapered masts, length of spinnaker poles…..
One matter causing mayor difference in opinion was measurement of main sail on large yachts. The British argued that Bermuda sail should not be allowed on 12mR and above. They preferred the cutter rig with a gaff main and top sail, however, sail configuration was agreed to be a design matter. In Scandinavia the Bermuda sail plan was adopted on most yachts. One reason was that the Bermuda sail was easier to handle than the gaff sail. Dispute arose how to measure the two different sail configuration. The manner this topic was handled by the Permanent Committee caused critics and mistrust. Revised instructions for measurement of the gaff top sail as well as the Bermuda main sail were in February 1923 issued in the name of the Permanent Committee without prior mutual agreement between the committee members. The differences related to the British demand for only including part of the top sail area (75%) when calculating factor S in formula, and that the curvature in the aft leach on the Bermuda main should be included 100%. The reason was given in a letter from the chairman of the Permanent Committee, Mr. William Burton stating that unless such means were introduced it would be no new construction of 12mR in UK. Johan Anker and SSF felt this was unfair and in favor of the gaff sail compared to the Bermuda sail. The instruction from the Permanent Committee was not approved by SSF and was not put in force for racing in Scandinavian countries and Finland. 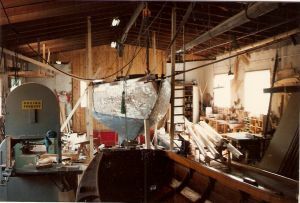 Norway had at the time three 12mR with Bermuda sail and one under construction. A solution could have been to introduce “rig respite” between Bermuda and Cutter-rig, Cutter to Yawl and Yawl to Schooner which earlier had been used for classes above 23 metre, but this was no alternative to the British. The discrepancy did not come to a vote as it mainly concerned the British and the Scandinavians. Sir W. P. Burton acquired 50% of the 12mR being constructed at Anker & Jensen A/S. His plan was to prove that Ankers 12mR with Bermuda sail was competitive with the British although its sail area was less. Sir Burton was at the time one of the best yachtsmen in Britain. The R-1919 rule expired on December 31st 1925. A conference within I.Y.R.U. was called for by the Permanent Committee to take place in London on October 16th 1924. The experience with the R-1919 rule was good, especially within the large 6mR class. Both Britain and Italy did to the October 1924 meeting present proposals for extending the rule for a longer period of time. Regio Yacht Club de Italiano suggested the Formula to be extended for 10 years from December 31st 1925 with minor modifications to be agreed. If modifications impose preferences for new designs, old constructions should nevertheless be measured likewise. Thus implicating that Rule article 20 about measurement of old yachts would be deleted. The British proposal consisted of an extension of the Formula for an unlimited period of years with three (3) years notice of termination to be supported by 2/3 of the I.Y.R.U. members. Subject to rule 20 concerning old yachts the British suggested this to end on December 31st 1924 for the 6mR Class and December 31st 1925 for the larger classes. Sweden suggested separately that the Rule should be made valid for a period of three (3) years at the time with three (3) years notice of termination. It had proved difficult to get Lloyds and the British to go for stronger scantlings and SSF suggested revert to the 1st Rule scantlings. A further proposal of giving Scandinavia two representatives in the Permanent Committee was presented by Benzon, SSF. Agreement made within I.Y.R.U. on Oct 17th 1924 was to extend the Rule for three (3) years period at the time. Notice of termination was to be given three (3) years in advance and supported by more than 50% of the members. If extraordinary design requires, coefficients may be changed every 2nd year. This was made applicable for yachts 12mR and below. A committee consisting of members from Britain and Scandinavia was established granted full authority to negotiate and agree with New York Yacht Club a Formula for yachts above 12mR. Subject to measurement of older yachts as included in R-1919 article no 20 this was agreed to expire December 31st 1925. The number of members within the Permanent Committee was increased to seven (7), Britain two (2) delegates, two (2) delegates from Continental Europe – one from the Mediterranean and one from the Channel Coast, two (2) delegates from Scandinavian and one (1) delegate representing Holland and Belgium. Subject to scantlings; thickness of planking on 6mR was increased by 2mm made applicable for boats constructed after Jan. 1st 1926. As to classes 8, 10 and 12mR several changes were agreed promoting stronger hulls. Changes should not be forced upon yachts commissioned for racing in 1925. One mayor change affecting the Measurement Instructions for sail took place. How this came about is not sure, as this probably was not discussed in detail at the Oct 16th/17th 1924 meeting. The instructions prepared for Measurers included in DnV printed 1921 edition of Rules and Regulations regulates under; Measurement of sails, article 29, item foresail, that in case the foresail is larger than the calculated area I x J/2, the surplus should be added to factor S in formula. This principle is the same as laid down in the S-1917 rule Instruction for Measurers article 28 fore triangle and regulates the use of overlapping jib (bredfokk), from 1926 on known as Genoa. In DnV printed 1928 edition of Rules and Regulations including Instructions for Measurers up to April 1st 1928, there is nothing about measurement of “bredfokk”, overlapping jib – Genoa. The subject of measurement of fore sail became a matter for discussion after the introduction of the Genoa on 6mR in 1926. The overlapping jib was not new, "bredfokk" had already been used in Norway by fishermen going out to sea in late 1800, and as shown on picture from the first Kattegat Cup races. Go to Rules History; S-rule of (1902-1903). The use of overlapping jib and other large fore sails was regulated under Measurement Instructions to element S in formula. With the extension from 1926 of the 2nd R-rule of Oct. 1919 this regulation disappeared which opened up for the renaissance of the overlapping jib without any penalty, - to be called Genoa after its revival in the 1926 races in Genoa. “I.Y.R.U. Permanent Committee issues in spring 1928 warnings for changes that may come related to the larger fore sails? - Max width of fore sail on yachts 12mR and less not to extend more than 15% of R aft the mast (i.e. 1.2m aft mast for an Eight Metre). Any surplus to be added to “J” when calculating sail area “S” in formula. Neither of these two proposals was agreed to by the I.Y.R.U conference in October 1928. No restriction was put on limiting size on fore sail. The 75% restriction on max height of fore sail was decided by I.Y.R.U. in Dec. 1932, and max width of Genoa jib restricted to 0.5xR aft mast on 5,6 and 8 metres in Sept. 1937 as decided upon by the Permanent committee in Nov. 1936. Change in rule Formula came about in Oct. 1933.”, unquote. When extending the R-1919 rule in October 1924 the older yachts R-1907 and S-1917 still proved competitive with the new designs. One mean to diminish their competitive edge was as demanded by the British in 1920 to change bow and stern girth difference factors in measuring L in formula. This was denied by the Scandinavians who in addition to their own fleet had acquired most British yachts during the War. The compromise was Oct. 1919 Rule article 20, allowing yachts laid down prior to January 1st 1920 to measure in with bow and stern girth difference factors as before. By the decision of Oct. 1924 to delete Rules article 20, the “older yachts” had from Jan 1st 1926 to renew their measurement certificates with the same bow girth and stern girth difference factors as new boats, affecting other factors as S in formula. How this affected the keeping of old yachts is illustrated by 8N1 “Brand V” ref; sH22 Data Sheet information obtained from Avia Wilment, UK and Chad Wilson NZ, History and details, quote; “Sold off because of movement to alter class measurement”, unquote. A further outcome was the the N.L. rule (S-rule of 1926). By not keeping the penalty in measurement instructions for overlapping jib the older yachts competitive edge in light wind was from Jan 1st 1926 further reduced in favor of new constructions with larger and more seaworthy hulls, easier to handle when wind force picked up. Increased sail force caused more mast failures resulting in scantlings and min weight restriction on masts. These were also made applicable for older yachts measuring in under the amended R-rule of 1928 and 3rd R-rule of 1933 which are not fair for the older yachts laid down before the extension of the Oct. 1919 R-rule on January 1st 1926. With improved knowledge about sail aerodymamics the height of sail area on most Eights, old and new designs, was increased. 8N23 "Irene VI", Bjarne Aas 1927 had initially a L.W.L. of 9.2m and sail height of 18.4m above water (2xL.W.L.= 18.40). From January 1st 1928 the rule was ammended restricting height of sail area to 2xR+1 or max. 17m above deck for an Eight Metre. For yachts laid down prior to 1922 and still to be measured to the R(1919) rule without ammendments, increased height of sail was accomplished by yacht floating trim. Most S-yachts had an initial L.W.L. of approx 8.25m and freeboard 0.75m. During measurement , gear, including anchors and anchor chain were located in the cabin making the bow float higher, thus giving a shorter floating waterline, and less length factor "L" in the formula allowing greather sail area "S". By keeping the anchors and anchor chain in their position up front, the bow would float lower resulting in an increased L.W.L. An increase in L.W.L. would allow higher sail on mast. However, increased L.W.L. gave a larger measured length "L" in formula and somewhat reduced freboard "F", thus causing the sail area "S" in formula to be adjusted accordingly. For a yacht with freeboard "F" in formula of 0.70m, a sail height of 17m above deck would measured in under the R1919 rule without ammendments, require a minimum L.W.L. of (2xL.W.L. - 0.70) = 17 corresponding to a L.W.L. of 8.85m. Checked against the R(1919) minimum displacement requirement; (0.2xL.W.L+0.15)cubic capacity, a L.W.L=8.85m further corresponds to a minimum displacement of 7.077 m3. Subject to "Snarken" her floating waterline was checked in the spring of 2009 by putting tape strips on her bow before launching. Her L.W.L. in masted condition with main sail on boom, jib, anchor chain and two anchors in the bow proved to be a close to 8.9 m, let's say 8.88m which sounds to be a great L.W.L. for an Eight, which corresponds to her displacement, ref. 8mS register, data sheet sH38. "Snarkens" present sail area "S", stated on her sH38 data sheet is 75sqm compared to 90.32sqm in "Verano II" R(1919) Certificate of June 2nd 1920. Tuning up "Snarken", measuring her to the R(1919) rule without amendments, with a racing floating line allowing her a sail height of 17m above deck, and upgrade her sail outfit to meet R(1919)=8.0, should be an experiment of value to the History of the Eight Metre and Norways most famous yacht designer - Johan Anker. An alterntive for discussion would be fit her out with a modern mast and measure her to the 2nd rule 1928 ammendment or the R-1933 rule. Without changing her R=8.0 tuning condition, part of the experiment could be to also measure her to the S(1917) rule modification of the R(1907) rule, and as such bridge the gap between the first and second international R-rule. In the years 1920-1926 no races takes place between the Scandinavian countries for the Kattegat cup. In Norway, Johan Anker and KNS is focusing in on la Coupe de France, which in 1921 is moved to the 8mR Class. Owner of 9mR (old) ”Pandora” A. Scott-Hansen had in summer 1920 moved to France. “Pandora” which in spring 1920 had been converted to the 8mR (new) Class with Bermuda rig and sail racing no 8N12 was sold. In 1921 she again races in the 9m Class. When he was called to France, A. Scott-Hansen served as president of KNS. Johan Anker now resumes the duty as president for KNS. In fall 1921 Johan Anker is in France. His discussion with French yachtsmen results in Norway challenging France in races for la Coupe de France. The Cup had been raced for since 1891. In 1921 the cup was moved to the 8mR new Class with the first races to commence in this Class in 1922. Races to take place in Le Havre in September 1922. Johan Anker designs 8mR “Bera” for a consortium headed up by him self. “Bera” is the first 8mR Anker designs in accordance with the modification made to measure “L” in the R formula and the new scantlings agreed by IYRU in their December 1921 meeting. Drawing of “Bera” is dated February 20th 1922. First “Bera” is allocated sail racing no 8N19, however, as “Pandora” had gone back to the 9m Class, her 8mR sail racing no became vacant. As a curiosity Scott-Hansens sail racing no 8N12 from “Pandora” and the 1920 Olympic trials, follows him to France with Norways first challenger to la Coupe de France, 8N12 “Bera”. However, "Bera" must have been back in Norway some time during 1923 as she is pictured in Seilas no 30, 1923 matching Ankers new design 8N19 "Ranja". Compared with the Olympics in 1920 no races were in 1924 called for in the old international classes. Only 3 classses in the races which took place outside le Havre, 6mR, 8mR and Dinghy. In the 6mR Class Eugen Lunde with Six Metre "Elisabeth" won Gold Medal for Norway in addition to "Bera" in the 8mR Class. Returning to Norway “Bera” was in 1925 sold to Leon Jensen in Bergen. Eight Metre (new) 8N12 “Bera”, Johan Anker 1922 racing on the Trondheimsfjord in 1930. Owner Leon Jensen, Bergen. 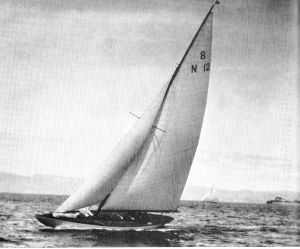 Among the local competitors in the Eight Metre (old) Class was H19 “Lucie IV” Johan Anker 1912, owner late Ole Östlund (1874-1967), Trondheim. 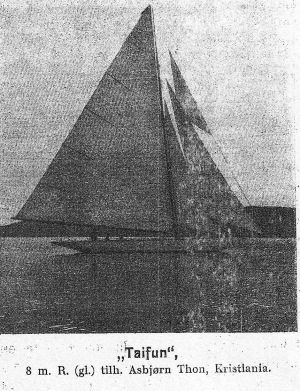 ”Lucie IV” had her Bermuda sail plan from 1925. Based on the experience racing “Bera”, “Lucie IV” was in 1931 fitted out with a taller mast and modern sail plan with only one jib, main sail height 17m above deck. Go to Snarken history part III. NFSU (Mid Norwegian Race Week) in Molde 1934. "Peer Gynt" and "Lucie IV"
To defend la Coupe de France for Norway in 1923, Johan Anker designs 8N19 “Ranja”. Drawing dated February 13th 1923. The races for la Coupe de France took place outside Horten, Norway in July 1923. Challenger was 8mR “Namooussa” owned by Louis Breguet, France. 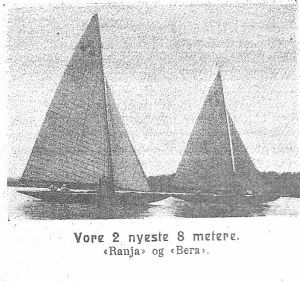 As “Bera” the year before, “Ranja” won 3 races in a row. She also won the cup for Norway in 1924 and 1925. Ankers 1924 construction 8N20 “Varg” did not qualify. Challengers in 1924 were 8mR “Coq Gaulois” owned by Henry Lesieur, and in 1925” l’Aille 4” owner madam Hériot. Norways yacht designer Bjarne Aas constructed in 1925, 8N21 “Hvide” who became a strong challenger to “Ranja”. Bjarne Aas was at the time well reputed for his success with his 6mR designs. His Eight Metre sH30 “Bidevind” from 1918 was in 1920 converted to the R-rule of 1919 with sail no 8N8 “Bidevind”. In 1924 his 6mR design “Elisabeth 5” won Gold in the Paris Olympics with helmsman Eugen Lunde. In 1926 Ankers new design 8N22 “Rollo” was selected defender for Norway. The qualification races were part of KNS spring regatta 1926. Only two competitors in the 8mR(new) Class 8N21 “Hvide”(Aas) and 8N22 “Rollo”(Anker). Last 3 years winner 8N19 “Ranja” did not start. She was in fall 1926 sold to Stockholm. “Rollo” and “Hvide” won each day. 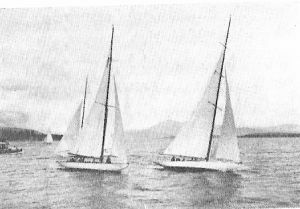 In the 8mR(old) class for first rule yachts R(1907) and modified first rule yachts S(1917), “Snarken” named “Idyll III” with her new owner Einar Pedersen and revised sail plan, won both days. Her finishing time, in the second days lighter breeze, was faster than the winner in the 8mR (new) Class, 8N22 “Rollo”. Compared to the Olympics in 1920 no races had in the 1924 Olympics been called for in the old international classes. Only 3 classes in the races which took place outside Le Havre, 6mR(new), 8mR(new) and Dinghy. Together with “Bera” in the 8mR Class, Eugen Lunde won Gold for Norway in the 6mR Class with “Elisabeth 5” designed by Bjarne Aas. In call for entries to KNS International Regatta at Hankö and Kristiania (Oslo) in July 1924 the R(1907) Class and S(1917) Class are united sailing on equal terms. Most Eight Metres from the R(1907) Class had converted their yachts from Gaff to Bermuda main sail. The R(1907) yachts handicap of 12 sec/nm to the S(1917) yachts in wind forces less than 5 m/sec, as decided by the Scandinavian Sailing Federation in February 1918 due to the R(1907) larger sail area, is no longer made applicable. If length of spinnaker pole is longer than the distance from mast to forestay in the sail plan, “J” in formula is the spinnaker pole length. Yachtsmen favouring competition found the 6mR(new) Class more economic favourable as the cost of constructing and keeping Eight Metres and above escalated. Furthermore yacht second hand prize was largely reduced as new constructions beat the existing. Many of the large “old class yachts” were in mid twenties sold out of Norway. 8mR (old) “Ierne” was sold back to Britain and others to Sweden. Some were kept for cruising. In an effort to get the older large yachts back to the racing field, Scandinavian Sailing Federation in 1926 agrees upon the N.L. (Nordic Length) handicap rule, go to Rules History, “S-rule of 1926”. Challenger in the races for la Coupe de France in 1926 was 8F12 “Cupidon III” designed by J. Guedon and constructed at “Bellet & Castéra” in Bordeaux 1925, owner Philippe de Rothschild, representing France. “Cupidon” design was narrow and shallow and outfitted with an overlapping jib (Genoa) for use in light weather. More like a converted S-Eight? 8N6 “Lyn” ex sH27 “La France” had beaten 8mR(new) “Antwerpia” and won Silver in the 8mR(new) Class in the 1920 Olympics. Le Coupe de France competitors in 1926, “Rollo” and "Cupidon 3"
The 1926 la Coupe de France races took place at Hankö July 2nd –4th. The French strategy hoping for light weather succeeded and “Cupidon” performed well in the light breeze. When the breeze picked up “Rollo” proved her potential but “Cupidon” won all three days taking the Cup back to France. “Snarken” named “Idyll III” had a better finishing time than “Rollo” in the 2nd days race of KNS 1926 spring regatta. Outfitted with a Genoa, her performance in light wind would improve even more. Norway filed a challenge for the next races to take place in Le Havre in July 1927. However, Britain represented by Royal Thames Yacht Club also filed a challenge, which was accepted by the French. Three years travel to Norway had been hard, and the risk of the Norwegians winning again, and future races to take place in Norwegian waters was likely too much for the French. The statutes for la Coupe the France stated that France could decide were next year races should take place independent of the winner country. The risk of having to defend the Cup in southern waters resulted likewise in that the interest from Norway vanished. KNS focus was again directed on the Kattegat Cup for which no races had taken place since sH25 “Apache” won in 1919. From a sail aerodynamic point of view it is interesting to note how the latest thinking in 1926 had not reached the Norwegian yacht designers. In the mid 1920ties the gained knowledge about the effect of the gap between the jib and main sail had in Norway resulted in a tall large main sail, an aft tilting mast and a narrow jib with limited “J”. With her overlapping jib (Genoa) “Cupidon” represented the future to come. The gap effect was maintained and her sail area increased with improved performance in light breeze. It would take the Norwegian designers more than a year to catch up. The most extreme 8mR yacht in Norway designed with a large main sail on a tilting mast and with a limited narrow jib, was Bjarn Aas 8N23 “Irene VI” constructed in1927. Owner was Eugen Lunde who had won Gold Medal in the 6mR Class in the Olympics in Paris 1924 with Bjarne Aas design 6mR “Elisabeth 5”. Lunde was most likely looking for an Eight Metre to participate with in the upcoming trials for the 1928 Olympics. 8mR “Irene VI” sail plan dated Dec. 1926 has top main sail 18.40m above L.W.L. or 17.60m along the aft tilting mast above deck, sail on boom 7.20m and jib J=3.70m, total sail area in formula 76,054 sqm. Her freeboard “F” in formula was 0.91m, and max beam 0.73m (comparable to Ankers famous design of 1930, 8N26 "Silja”). The outcome of the upcoming I.Y.R.U. meeting in London in February 1927 put restrictions on height of masts but no penalty on overlapping jibs. Together with other matters agreed upon by I.Y.R.U. and to be put in force from 1st jan 1928, as permanent cabin top on Eight Metres, Bjarne Aas masterpiece for Lunde, “Irene VI” was outdated her first year. The same faith struck also 8N24 “Varg III” constructed by Anker in 1927. “Irene VI” proved, however, to be an excellent performer and she was selected to represent Norway for the Kattegat Cup races in 1927 and again in 1928. Challenger in 1927 was Estlanders design 8mR “Carbonita” representing G.K.S.S., Sweden. In 1928 the Swedish challenger was a new Carbonita. Winner both years was “Irene VI”. The first 8mR yacht constructed in Norway in accordance with the R(1928) amendments was Ankers 8N25 “Noreg II” (drawing dated 14.12.1927) who represented Norway in the 1928 Olympics. To make this happen Anker organized a consortium with Crown Prince Olav. 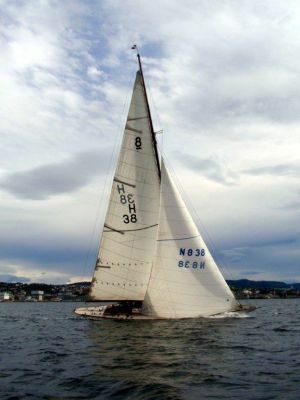 8mR “Noreg” was outfitted with a Genoa jib for use in light weather, however, she did not perform up to expectations during the Olympic races mostly due to two mast failures. Crown Prince Olav won Gold Medal together with Johan Anker as helmsman and his son Erik Anker in the 6mR Class. The strength of masts and rig on several Eight Metre yachts were not yet up to standard in order to cope with the increased forces from the Genoa jib. However, was the “Genoa” truly new? Fishermen going out to sea had already in late 1800 overlapping jibs, and pictures of the first Kattegat cup races in 1902 and 1903 shows competitors with overlapping jibs. (Go to Rules History section “S-rule of 1902/1903”.) What was new, was the overlapping jib in combination with the Bermuda main sail and taller masts. To the 8mR World Cup Races in Norway in 1983 at Hankö, 8N23 “Irene VI” was in 1981 acquired by Ole Östlund, at the time residing in Stavanger. A new and modern sail plan was designed to “Irene VI”, with top main sail above deck 17m, and J=5.0m. Unfortunately “Irene VI” did not make it to the starting line at Hankö in July 1983 and Ole Östlund crewed onboard his fathers Eight Metre “Snarken”, racing sail no at Hankö 8N38 (go to LINKS: “Snarken” to 8mR WC Hankö 1983). Part of the history is that Ole Östlund in 1981 obtained the permission from KNS to construct an Eight Metre in accordance with Johan Ankers last design, 8mR project of 1940. Johan Anker who in 1938 successfully had constructed 8N33 “Sira” aimed with his 8mR 1940 project to make an even faster yacht especially down wind compared with “Sira”. In 1981 it was uncertain how IEMA (International Eight Metre Association) would look upon a new construction based upon an old drawing. To day the situation is solved and replica of old yachts are constructed and commissioned under their applicable rules. In fall 1981 the price negotiations for “Irene VI” settled in a most favourable way, and the decision to repair and commission her for WC 1983 was made. “Irene VI” had during the years proved to be a fair challenger to “Sira”, and with a modern sail plan and outfitting, her potential would improve. It was also uncertain if Ankers “1940 Project” would perform better than “Sira” and “Irene VI”. 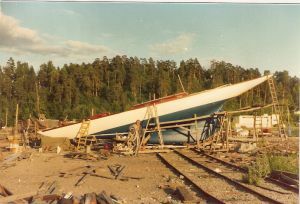 Ole Östlund made a promise that if a commissioned “Irene VI” with new sail plan and gear during trials at Hankö in spring 1983 proved to be faster than “Sira” he would offer “Sira,s “ helmsman King Olav to race her in the WC in the best interest for Norway. Ole Östlund had already discussed with Peder Lunde, grandson of “Irene VI” first owner Eugen Lunde if he would race “Irene VI” at Hankö in 1983 to which Peder accepted. Peder Lunde won Gold for Norway in Flying Dutchman in the 1960 Olympics. The thinkable switch with King Olav would have been made in mutual understanding with the parties involved. As “Irene VI” never met the starting line this question never occurred. 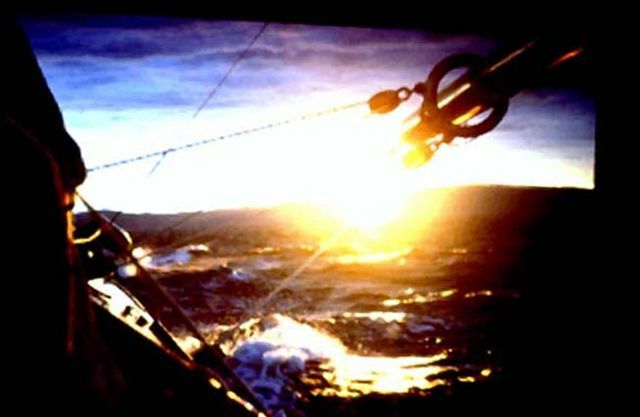 Norwegian Sail-Meter Association (NSMF) was founded in 1982 with Ole Östlund, Peder Lunde, Nils Ekjord and Jan Bjercke. The association was founded to preserve and promote Classic Yachts and Sailing in Norway, and the first project was “Irene VI” to IEMA 8MR WC Hankö 1983. When the project stranded, so did also the activity within NSMF. An early offer for replacing “Irene VI” underwater planking at Killingen, Oslo, was received. However, Risør Trebaatbyggeri (RTB) offered to repair the entire hull, frames and planking, indoor at their yard in Risör. Total cost would be less than their offer for constructing a new Eight Metre based upon Johan Ankers 8MR Project of 1940. On this basis of understanding “Irene VI” in spring 1982 was towed from Oslo to Risör. In fall 1982 total prize quoted from RTB escalated beyond their offer for constructing a new Eight Metre, which already was the highest of the three competitive bids received. Mr. Ostlund did not accept to be screwed. How could the project group face potential sponsors with project cost above the cost of constructing a new Eight Metre? This was a matter of principle. And as such the decision was made to move the project to an other yard. However, as this was opposed by RTB, the project; “Irene VI” to 8mR WC at Hankö 1983, stranded. KTK, Classic Yacht Club in Norway was established in 1990. When the 8MR WC returned to Norway and Hankö in 2008, an attempt was made by Ole Östlund to revive NSMF as NEMA (Norwegian Eight Metre Association) with the purpose to support and encourage more Norwegian Eight Metre owners to commission their yachts for participation in the upcoming 8MR WC event at Hankö. Good for the Class is that Johan Ankers Project 1940 some years ago was constructed in Portugal, given the name “Aun” under Japanese ownership. “Aun” has proved her performance by winning the IEMA “Sira Cup” and “Venture Trophy more than once. She did not participate at WC Hankö 2008 when King Harald won the “Sira cup” with his fathers 8N33 “Sira”, and with 8mR“Silja”(Anker 1930) second in the “Sira” Class. First owner: Eugen Lunde, gold medal 1924 Olympics with 6mR "Elisabeth"
Other names: "Vienna", "Beduin", "Hai 4"
8N25 ”Tamara 8”, ex ”Noreg II” (Anker 1928) racing 8N23 “Irene VI” (Aas 1927). “Irene VI” won the Kattegat Cup for Norway in 1927 and 1928. With 3 victories including sH25 “Apache” in 1919, KNS won the 2nd Kattegat Cup. KNS gracefully put up a new cup for future races and which to day is the “Sira Cup”. The next winner of the Kattegat Cup after a retired “Irene VI” became Ankers famous design 8N26 “Silja”, constructed in 1930 and still sailing strong in Finland. “Irene VI” with mounted cabin top standing onshore at Bestumkilen, Oslo in the mid 1970-ties. Her owner at the time was Harald Gjersøe who before acquiring “Irene VI” for some years was the owner of Eight Metre “Madelon” first name “Betty III” and constructed by Anker in 1919 yard no 220, in accordance with the same drawing as “Snarken” (Verano II) yard no 223. The IYRU Feb. 1927 meeting resulted in that the 2nd International R-rule of 1919 became more a "restriction rule" than ever before. Ammended changes and restrictions to be applied with from January 1st 1928. For details go to "Rules History" section "R-rule 1933", including 2nd rule ammendments 1928 - 1933. The changes results in the R-rule of 1933 becoming real international as the Americans joins IYRU.